E85 fuel in an AMG? AMGonFire - it is *NOT* all about the octane. The octane rating only measures the fuel's resistance to knocking or pinging during combustion and how fast the fuel burns. Nothing else. A higher octane fuel is less explosive and actually burns slower than a lower octane fuel... which is why you're wrong. It's not about the octane - it's about the energy density per unit volume of the fuel, which is lower in ethanol by about 25%-30% than gasoline with the same octane rating. you keep repeating the same thing over and over. Iv already said yes e85 requires more of it to make the same power as race gas volume to volume. Not disagreeing with you there. Guess what I will use 30 percent more e85 vs your car on race gas. But guess what I will make the same power utilizing the high octane just like race gas. It is all about the octane because you need that resistance to knocking when you are advancing the timing. 105 octane race gas vs 105 octane e85 with a tune for both will net similar power gains. This is why it's used 2 bucks a gallon vs 7, race gas power all the time, readily available. It's hard to find race gas. You win and I give. "ethanol is essentially an oxygenating agent" - Nope, not when lit on fire. Had to leave one fact for you though. If that is what you were saying all along, then I apologize because that is correct... except that we're now at the little practical problem. As you yourself said, you will need to use 30% more E85 than you would race gas with the same octane rating to make the same power. The problem is that the stock fuel rails and injectors on the C63 can not deliver 30% more fuel than they do now at redline / WOT. You would need bigger fuel rails and injectors (something similar to the ones that Weistec uses with their S/C kits). LOL... you might want to fact-check your "fact" with VP Racing fuels and everyone else that uses it as an oxygenating agent... or just Google it. Here's a link to a Wikipedia article: https://en.wikipedia.org/wiki/Oxygenate. about 40 minutes from my house random gas station just stumbled upon it last time I saw it was a year ago though was 7.68 something like that. The e85 argument is easy for the w204 c63... Ready? Can it be done? Yes. Is it worth it? No. Pouring e85 in the tank isn't what gives you power. It's the timing/tuning. Trying to squeeze every bit of power out of your stock system is just going to cause problems. For e85 to work you need pumps/rails/injectors to support the addition fuel required which is just not feasible or worth it in the w204 and that's just the start. I'm not as much of a Debbie downer about e85 as some in here, either. I ran it in my FBO n54 135i. My JB4 (Tune) was capable of supporting multiple maps on the fly. I could literally change tunes while cruising down the road using OEM controls on the steering wheel. One of which was set to make adjustments for fuel and being a direction injection system it supported this. And yes, there was a very noticeable difference when I put in e85. The differences being lower mpg's but more power, mostly torque, because of the way it works. I also have easy access to e85 so if I felt like it I could just throw some in, change maps, and off I went. You do get some looks though when you put e85 in and then drive to another pump to top of with 93. But this is a completely different car. The only time e85, in my opinion, reasonably makes it into the discussion here is on boosted builds that have already gone the extra mile to make power and do so in a way where the car can support it. Filters / Tune --> Headers --> Supercharger. Those are you options with this car. After that if you still need more look to saving weight, better suspension, and better tires. If you go that far you've probably spent close to half (if not more) than what you spent on the car itself. But this e85 conversation that comes up every so often here just needs to fade because although it always leads to some fun posts it always ends with the same result: nobody uses it or if they do not as intended. Eurocharged in Toronto dyoned a bone stock 507 at 418 rwhp (which assuming a 20% drivetrain loss, is 501 crank hp - so the number is more or less correct). Assuming that all of the power gains claimed by Magnuson are due to a directly proportional increase in fuel delivery, it is still only 20%, not 30 - and they *DO* include upgraded fuel rails in their S/C kit. Weistec supplies new rails and injectors with their stage 1 kit for the M156. So - if both Magnuson adn Weistec supply upgraded fuel rails (and at least one of them also supplies higher flow injectors) to achieve a 20% increase in fuel flow, I'd love to learn how you're going to squirt in 30% without touching the fuel delivery system. Again, what am I missing? weistec does not supply bigger injectors until the stage three blower and yes with a stage 1/2 my car makes 580whp. So with stock injectors and pump it handles it just fine but even with the bigger rail it is very close to maxed out. Now as for the E85 yes the system will handle it with the eurocharged kit "think GM flex fuel" so once the module is in you can run 91 93 e85 or a mix of whatever you want or tune specifically for the e85 more so for track application i.e. 1/4 mile is where it comes in Great because you can make more power for cheap and not care about your miles per gallon. OK... I was looking in their Stage 1 kit instructions (http://weistec.com/media/productfile...6sc_c_s1s2.pdf), page 27 item (m): "Installing new fuel rails and injectors onto supercharger unit buy using 4mm Allen bit and 1/4" drive. Aluminum finish spacers will be used between manifold and fuel rail. ", but I don't have a S/C kit myself so that could be wrong. Anyway - both Magnuson and Weistec supply at the very least new fuel rails. So - the addition of an ethanol controller ONLY without upgraded fuel rails, not to mention a tune - which the Eurocharged post says is optional (!) - is not going to do squat. PurpleHeart how is eurocharged doing it? Have you seen their kit. I know you frequent these forums. Whatever you say, brother... I am completely wrong and the car will make 700 hp on E85 (and at least another 150 hp on top if you fart in the direction of the nozzle while fillign it up with E85) without touching the fuel delivery system. I am wrong and you are right. OK? It's hard for me to believe that other car ma cacturers can handle e85 but an Amg can't. Evo, sti, mazdaspeed, m series, 335i to say a few all run it google it. My buddy ran e85 in his wrx for 65,000 miles when he finally sold it and it ran flawlessly. I personally don't think that motor is better then a handbuilt Amg. The motor isn't "better" than your AMG handbuilt motor. But, e85 isn't damaging the motor it is actually cleaning it and burning "better." The corrosion and damage is limited to the fuel system. At the end of the day a w204 is just a c-class with a big v8. It's not as exclusive as you may think. Now on another thought flex fuel designed vehicles they are out there. Per the manufacturer can put either gas or e85 in it. Those vehicles have the same type of vehicle you can buy same motor but none flex fuel gas only. Do you really believe the internal motor or any of those parts are any different. And regardless most have said e85 is corrosive and damaging so it wouldn't matter anyways. Those manufactures warranty those vehicles the same as the rest. Why if e85 is so damaging? Refer above, but again, e85 isn't damaging the motor. The increase in power from properly supported e85 systems may wear a motor more rapidly but the e85 isn't doing it alone. I like to look at real world examples and there are a ton of them proving e85 can be used. Your "real world" examples are apples and oranges. Just because a Mazda does something doesn't mean an Mercedes will and vice versa. Of course the follow up to that is saying something like "show me an apples to apples comparison" which would be something along the lines of comparing an e85 M156 to a non-e85 m156. That being said you can't find this comparison because it doesn't really exist... And there is a reason for it. Using race gas does NOT require more fuel. Using E85 does - by as much as 30% - which the stock fuel system (it appears that the rails are the bottleneck) can't deliver, and certainly not without a tune. But again, you must be right because you read it in that one post by EC, and we all know that they can't possibly ever make a mistake or say something that isn't true. I have not. And I just went to EC's website and typed in "e85" in the search and got nothing back. I also don't really care about some simple mention of it in an EC tuning thread. Again, nobody is denying that it can be done. And sure, if EC is doing it then great! EC, e85, and c63's have been around for almost a decade. Ask yourself, out of the thousands of c63 members here, many of whom run tunes, how many run e85? Lastly, if I were you I would remain skeptical of advertised numbers that come from companies. Love EC to death, done business with them before and would continue to do so. However, I don't remain blind to the fact the auto industry has a very convoluted way of advertising numbers and the numbers games. i agree on skepticism. As far as running e85 previously there haven't been any tuning option or flex fuel kits till now. Maybe I'm wrong. I never saw any in previous post on this forum. New modifications come out all the time e85 isn't new but I think it is for this platform. My whole entire point in this thread was this other platforms have good results with it. I get they are diff motors but my point being non of those motors where designed to run e85. Yes the wrx had pump and injectors correct. But those motors are doing fine with it. Why wouldn't ours? No reason it wouldn't. It's been proven this car makes more power on race gas. Eurocharged has a flex kit out that seems according to them only to make good reliable power. I'd like to see real world examples not just eurocharged but at this point I might have to be that test dummy. Last edited by AMGonFire; 11-26-2016 at 02:00 AM. Diabolis no the stage 1/2 kits only come with bigger rail I run a 2 and you re use the factory injectors as a side note I also spray methanol injection 50/50 mix and it works incredibly well, with 93 in and the meth it's more like running 100 octane and yes it's safe and good for the motor because I'm NOT tuned for meth it's just a safety feature. As for the E85 is it worth it probably not for a daily driver option at least anywhere with a cold winter the mixture is garbage in winter. But as for race applications I can see it being something worth looking into especially with boost the extra power and cheap availability makes it in many ways a better option than let's say ms109 or higher octane gas and it all comes down to price. As for the kit at $2000 plus install and tuning it's really not worth it I would tell someone to buy headers first but if they were fully built motor and blower or turbo etc.. the e85 could be the extra bit that gets your times down then the cost may be worth it I have seen 100 HP difference on boosted cars just by switching from gas to E85. But those motors are doing fine with it. Why wouldn't ours? Never said our motor wouldn't be fine. It's the fuel system. Like I said, if anything, it'll actually clean things up a bit from burning better (cleaner). But corn fed cars do suffer from sediment build up within the fuel system which is where the problems come from. This includes from tank to injector nozzles that get gummed up. 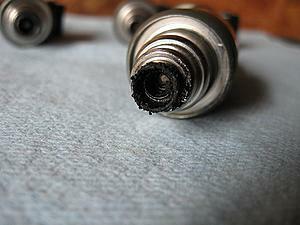 Now, imagine that over time the injector starts clean and slowly builds up. The car will slowly, but surely, run worse and worse over time. How much time/miles? Depends on too many variables and "If's" but you will end up there 100% of the time. Race gas vs. e85 which has also been brought up... Don't want to dive it too much here but yeah the results between the two may be similar but if you're running e85 you need more supporting mods in place than race gas because of the amount of fuel flowing. Bottom line, an amount of flow is required using e85 that the stock system does not properly support. Also -- Go look at all those other platforms doing fine with it and you'll likely notice those platforms either start with turbo's and/or direct injection. By now you know the c63 is neither. You keep asking why the c63 can't do it and it is because it wasn't built to do so. AMG engineers weren't thinking to themselves "How can we build this car to support modified cars running high ethanol?" I can't offer any other words than that. I circle back around to my point where e85 can make sense on a c63. One that is boosted and heavily modified to a certain point. But 99.99% of c63's aren't there and never will be there. Most are just DDing the car or a weekend warrior and if you're either of the two e85 truly is not worth it. That all said, I don't know what kind of value people put on a couple extra hp vs cost and some of y'all are some crazy dudes. Edit: $2k + install + tune... Yeah, if that's the case I'm not worried about trying to convince people not to do it. Plenty of members here running budget oil changes, brake pads, all season tires, and eBay CF bits that barely fit. You're exactly right, just tell people to get headers instead. Proven easy power. Last edited by CarHopper; 11-26-2016 at 02:43 AM.